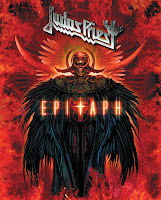 Judas Priest will play their concert film of their last tour, Epitaph, in theaters around the world prior to its release on DVD and Blu-Ray. Starting May 14, there will be a series of exclusive screenings in the US, UK, Germany, Austria, Spain, Sweden, Finland, Hungary, Mexico, Argentina and Brazil (with more countries to be added) with specific cities and dates to be announced next Tuesday. The show was filmed during the band's final world tour at London's Hammersmith Apollo during May 2012. Included were 23 tracks from throughout the band's career, all recorded in HD with 5.1 surround sound audio mix.